On Monday, February 12, the EST/Sloan Project is excited to host, as part of the 2018 First Light Festival, the first public reading of CITIZEN SCIENTIST, the moving new play by Christina Quintana. The play follows the pursuits in 2010 of two inquiring minds, one a young astronomer seeking a tenure-worthy project at a major university, the other a retired actuary in his sixties eager to find a way to make an enduring contribution to science. What brings them together is the project the astronomer wants to develop using the innovative new approach to scientific research begun in 2007 by the Citizen Science Alliance, a group of scientists, software developers and educators who draw on the time, abilities and energies of a distributed community of citizen scientists to further science. Their work is best known through their web portal, the Zooniverse, which now has accounts for some 1.6 million citizen scientists pursuing projects across astronomy, physics, biology, philosophy, and the humanities. But let’s hear more from the playwright. What drew you to write a play about citizen scientists, and the Planet Hunters project specifically? We all know what it’s like to stare with wonder at a starry night sky—how incredible that anyone with an Internet connection can help discover a planet, no PhD necessary! There was a citizen scientist named Kian Jek involved in the discovery of the planet PH1 in 2012. Is the character Kian Chung in the play based on him? Did you have the opportunity of meeting or interviewing him? I haven’t met Kian, but it’s true that I borrowed his name! It was actually two planet hunters, as I’m sure you learned—including Kian Jek—who helped discover PH1. I decided to name the character in the play Kian J. Chung since he is his own man, really a total creation beyond age, first name, and hometown. I don’t see any scientist named Neema Otieno involved in the Planet Hunters program. Is she your own creation? Planet Hunters was actually launched in 2012 by a team led by Debra Fischer, a professor of astronomy at Yale. I invented Neema because I wanted to write about a woman of color in STEM, specifically a brilliant astronomer who struggles with imposter syndrome in the face of creating a truly unique program (i.e., Planet Hunters). Did you interview any scientists actually involved in planet hunting as part of your research? I interviewed Dr. Sarbani Basu, head of Yale’s Astronomy Department. When I reached out, she responded to me within the hour. Unlike Dr. Williams in CITIZEN SCIENTIST, Dr. Basu is one of the most delightful academics I have ever spoken to! She’s a real trailblazer and her insights hugely informed revisions, particularly straightening many of my question marks about the day-to-day of an academic astronomer. The two lead characters in CITIZEN SCIENTIST share the trauma of having lost someone close. Loss of memory, of identity is also the subject of your recent play Azul. Does loss have a special meaning for you? To be honest, all of my writing circles the themes of loneliness, identity, and the unexpected paths of connection we mine through both. I sat down to write the first draft of CITIZEN SCIENTIST six months after the loss of my father, and the experience was incredibly cathartic. This play has helped me heal in ways I never expected. 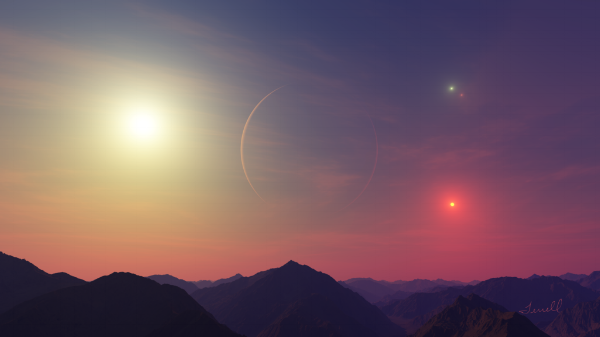 Artist Dirk Terrell's vision of what sunset with four stars would look like on PH1. The travails and anxieties of Neema as a minority scientist seeking tenure in a major university feel earned. Have you experienced these kinds of issues yourself? What research did you do into the plight of aspiring scientists in academia? I worked as program staff in the Higher Education and Scholarship in the Humanities program at the Andrew W. Mellon Foundation for several years. This experience taught me a great deal about the increasingly cutthroat world of academia, particularly PhDs and post-docs at major research universities. I also did a lot of pointed research on the experience of women of color on faculty in astronomy departments, and STEM departments more generally. So much is being made these days about machine learning and artificial intelligence. Yet, what the citizen scientists involved in Planet Hunters are demonstrating is that there remains an important role for human intelligence and participation. Is that what drew you to this topic? Yes! That’s exactly what drew me to the topic. There have been many more planets and multiple papers published thanks to the good work of many citizen scientists. I encourage you and anyone reading this to hop onto the Planet Hunters website and do some planet hunting! Maybe you’ll discover a new world? Thanks for the prompt. I just downloaded the Zooniverse app. What do you want the audience to take away from CITIZEN SCIENTIST? I hope they’re hopeful—that, like Kian, you can make a fresh start at any age, and that fighting for something that you believe in—though never easy—is ultimately worth something, even if it’s something inexplicable. The play has a major role for a character resembling the forward on a woman’s basketball team. I’m wondering if you share Kian’s love for women’s college basketball? You caught me. I am a serious UConn Huskies fan, thanks to one of my dearest friends who got me hooked in college. Every year we take a pilgrimage to the Women’s Final Four together—and Stanford is no stranger to the competition! Is this a spoiler alert? Yes, our planet is a basketball player. You’ve been a member of EST’s Youngblood program. Has that played any role in the creation of CITIZEN SCIENTIST? EST/Youngblood has been vital to the creation of this play. I completed much of the first draft during our summer retreat and workshopped a later version in our meeting early this year. I’ve been lucky to have such an attentive and talented crew to help me shepherd this play into the world! Poster for Peppercorn Theatre production of Flor to Somewhere. I have a play called Three Thousand Seizures about a woman named Petra who struggles with her debilitating epilepsy symptoms and whether to proceed with neurosurgery, and a TYA piece called Flor to Somewhere about a young Latina who dreams of becoming the greatest aerospace engineer in the history of the world. What do you think are the particular difficulties of writing a play about science? I think it all comes down to striking the balance between heart and science, which can sometimes be tricky. In addition to being a playwright, you are also a published poet. Do you find that your poetry informs your playwriting? Or are they parallel but separate worlds? Well, now that you’ve read the play, I wonder about your answer to this question! I think all my writing across genre informs each other, but the genesis of each piece is singular. I have yet to read your poetry but yes, I do find the writing in CITIZEN SCIENTIST wonderfully rich in texture and tone. What’s next for Christina Quintana? A brand new play of mine, Mr. San Man, will have a Studio Retreat at the Lark with public readings on Monday, March 26th at 7pm and Tuesday, March 27th at 7pm. My play Azul will have a reading as part of the Playwrights Realm INK’D Festival of Readings on Monday, April 16th. The times are being confirmed, but there will be an afternoon and evening reading. Also, the other plays are wonderful and you should check out the full fest! Keep an eye out for a brand new interdisciplinary reading series (poetry, prose, plays) called BESPOKE at the Bureau of General Services Queer Division. I’ll be co-curating with poets and writers Jerome Murphy and Tim Murphy! More to come.